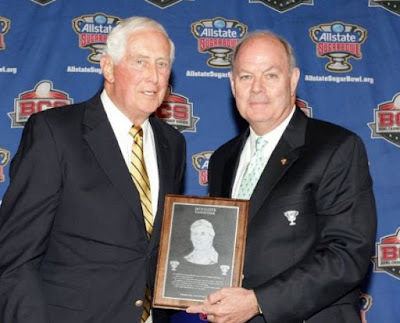 In August of 2012, longtime Covington High School Football Coach Jack Salter was inducted into the Greater New Orleans Sports Hall of Fame during the Allstate Sugar Bowl’s annual Awards Banquet at the Mercedes-Benz Superdome in New Orleans. The honor acknowledged his 33 year career record of 259 wins, 110 losses, and 8 ties, winning 70 percent of games played. 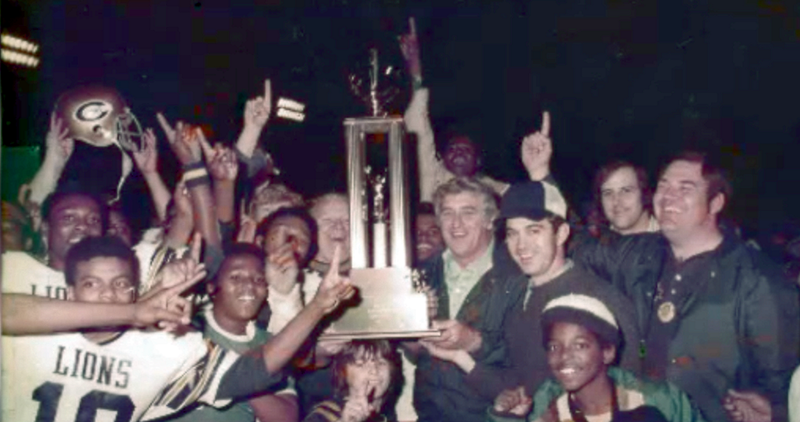 He led the Lions to four state championship games, winning the top state honor in 1976. He is seen below at left. retired, and Coach Salter became head football coach for the Lions. CLICK HERE to listen to Coach Salter's comments on coaching football. 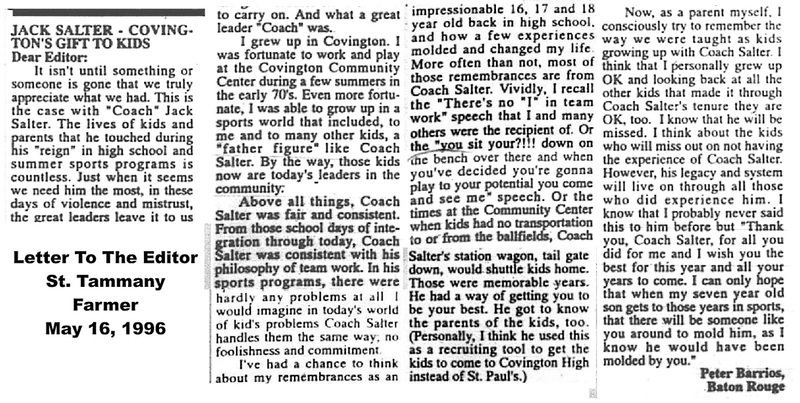 CLICK HERE to view a 2013 segment from a Channel 13 "Chalk Talk" television program that features Coach Salter's Hall of Fame Ceremony. According to the AllStateSugarBowl.org website, "Jack Salter served as football coach for 32 years, from 1960 to 1992. 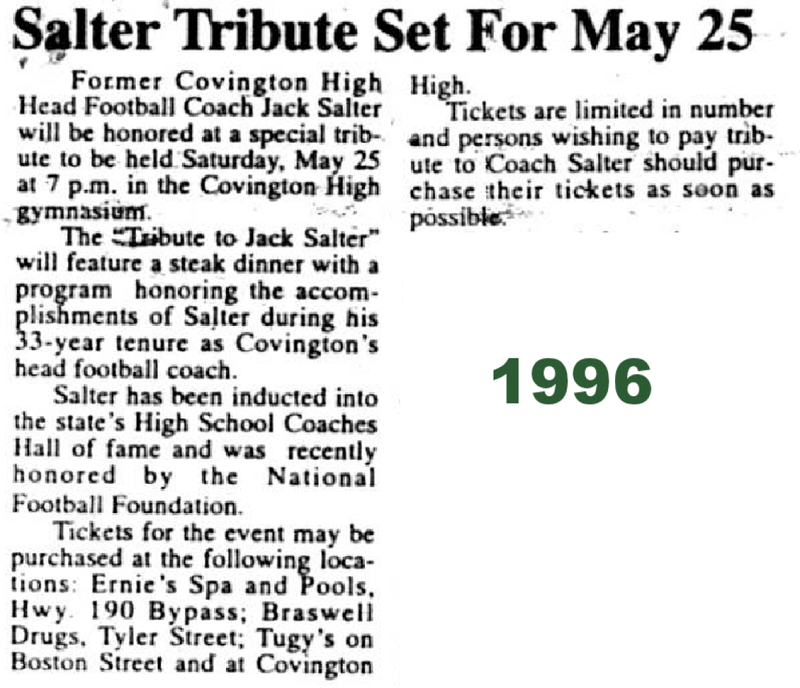 In a nominating article by Marty Mulé of the Greater New Orleans Sports Selection Committee, he said, "Jack Salter was born to be a football coach." When St. Paul's School fired him as an assistant coach in 1962, he became the aide of legendary coach Hubie Gallagher at Covington High. "Gallagher hired Salter, and a year later told his one assistant that he wanted to retire and that he would like Salter to replace him. 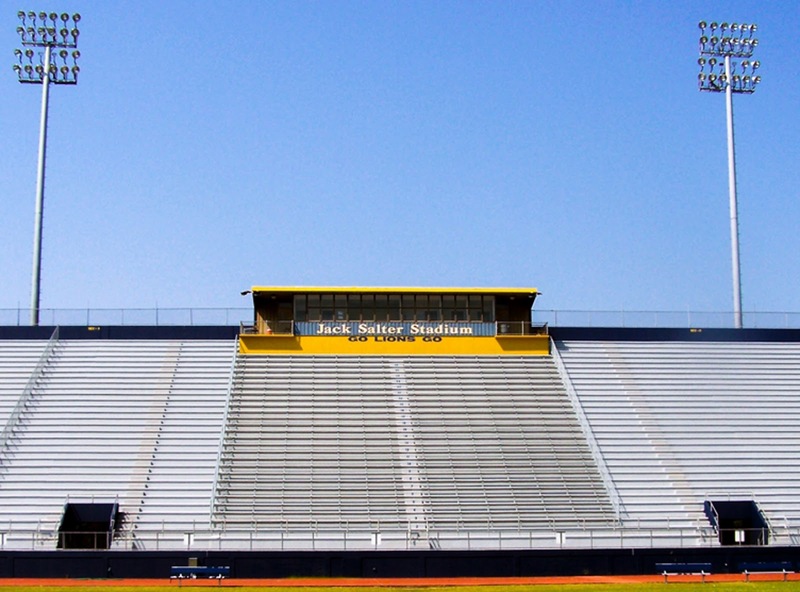 After a difficult start, Salter went on to become the most successful football coach in St. Tammany Parish history, forging a 256-110-8 record (a 70 percent victory rate over 33 years, despite the slow start), his teams winning 15 district titles, making four appearances in the state championship game and winning the 1976 state crown. At least 75 of the players Salter mentored received college scholarships." 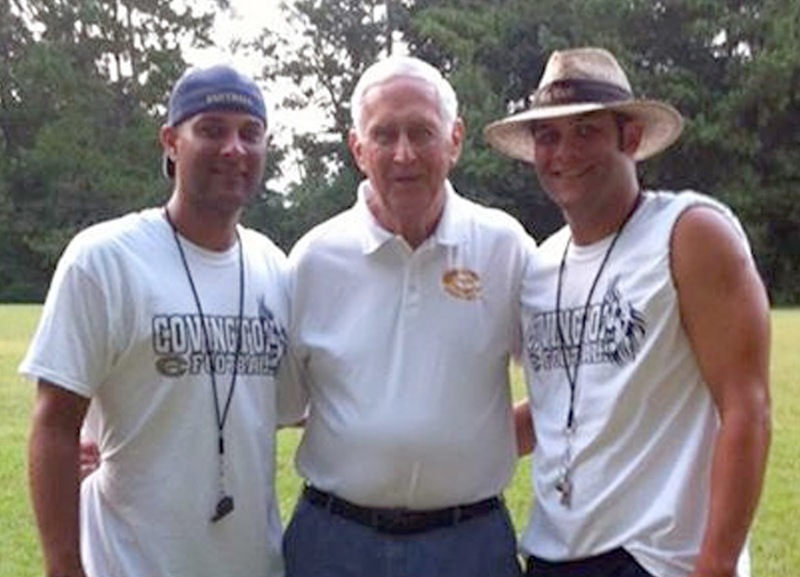 In 2011 Coach Salter told the story about the first "weight room" in the Covington High football program. Click on the above video to hear his comments. Stadium." 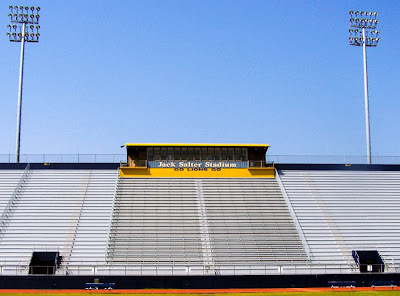 The resolution naming the Covington High School Stadium, "Jack Salter Stadium" was done to honor former coach Salter who coached at Covington High School for 34 years and was a former District, State, and National Coach of the Year and Hall of Fame inductee to the Louisiana High School Athletic Association, the Louisiana High School Coaches Association, and the New Orleans Sports Hall of Fame. click on the above video link. In August of 2013 Covington High School Head Football Coach Greg Salter continued the family tradition, as shown in this picture with his grandfather, former Head Coach Jack Salter, and his brother, CHS Linebacker Coach Glen Salter at Percy Quin State Park. "Joseph “Jack” William Salter was born on January 6, 1931 to the late Roger Noble and Ruth Collins Salter and was a resident of Covington his entire life. He was a lifelong parishioner of St. Peter Catholic Church in Covington. "He graduated from St. Paul’s High School in 1949 where he played football and basketball. After graduation he attended McNeese State University on an athletic scholarship to play both football and basketball. He graduated from McNeese in 1954 and returned to his alma mater St. Paul’s High to teach and coach for one year, prior to entering the United States Army. Jack entered the Army and was a First Lieutenant from 1955 through 1957. 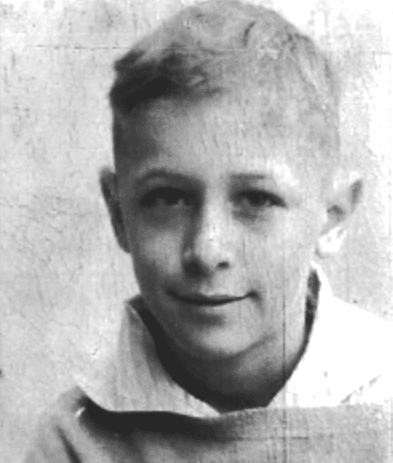 He then returned to St. Paul’s to coach and teach from 1957 to 1961. 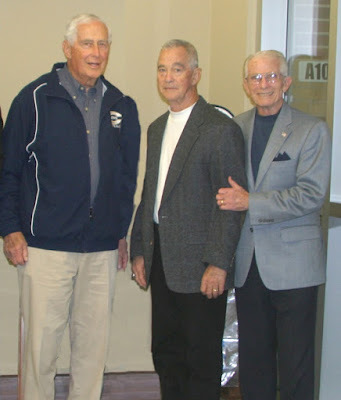 "After leaving St. Paul’s Jack was hired in 1962 by Hubie Gallagher as his assistant coach at Covington High School. The following year, 1963, he became the Head Coach of the Fighting Lions and remained there until his retirement in 1996. 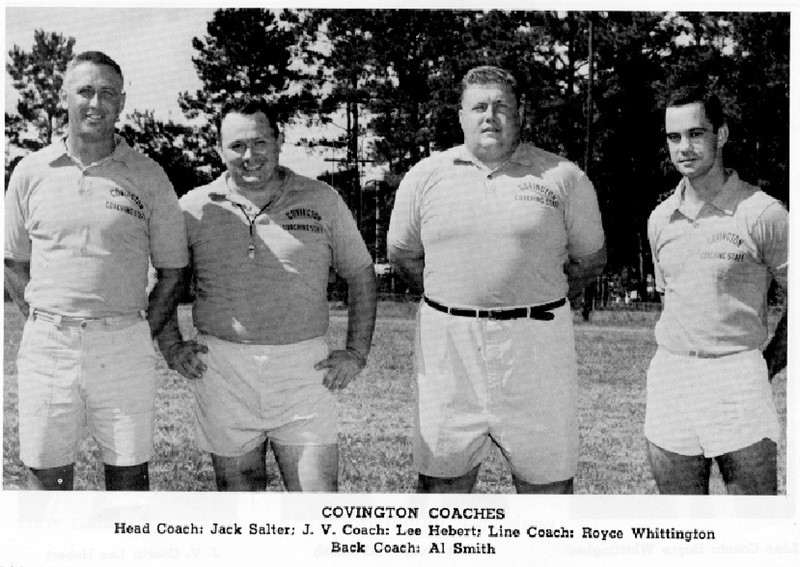 His dedication and love of Covington High and most especially Covington High Football, its Coaches and Players was unquestionable. 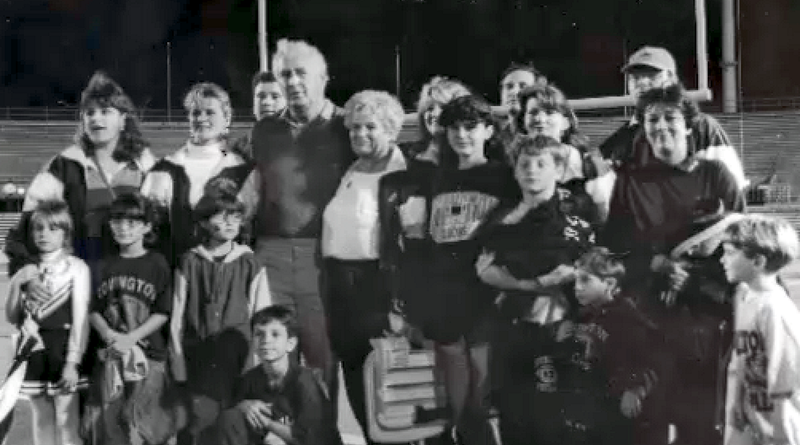 "He believed that coaching and teaching young men and women was his calling. He would tell his players and students that being a good person was the most important quality that they should strive to accomplish, because with that all things in life are possible. He wanted his players to take the lessons that he taught through football into the game of life, believing that life and football were parallel and that the lessons learned on the field would make for success throughout life. "His many signs hanging in the locker room – “always give 110%, There is no I in the word Team, No Pain No Gain” - professed not just how to play on Friday Nights but how to play the game of life. "His accomplishments as Coach of the Fighting Lions are numerous, but he would tell you without doubt that while many may bear his name, they belong to the team and that none would have been possible without the wonderful and dedicated Assistant Coaches and Players that he had the pleasure to walk the field with each and every day. 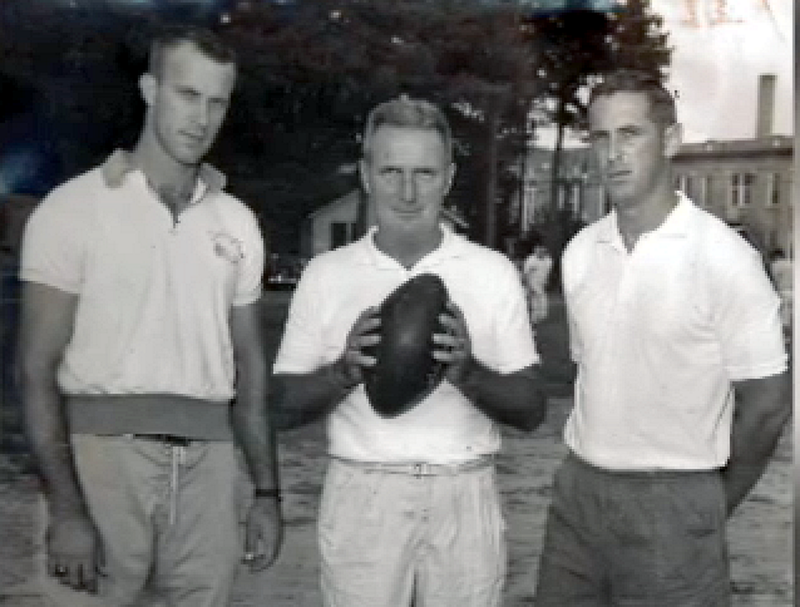 "Jack coached young men for 40 years. He is recognized as one of the winningest coaches in the State of Louisiana and is one of few to accomplish over 200 wins. The Lions under his leadership won 15 District Championships, made 21 State Playoff appearances and made it to the State Championship game 4 times in 1975, 1976, 1981 and 1987, winning the coveted trophy once in 1976. 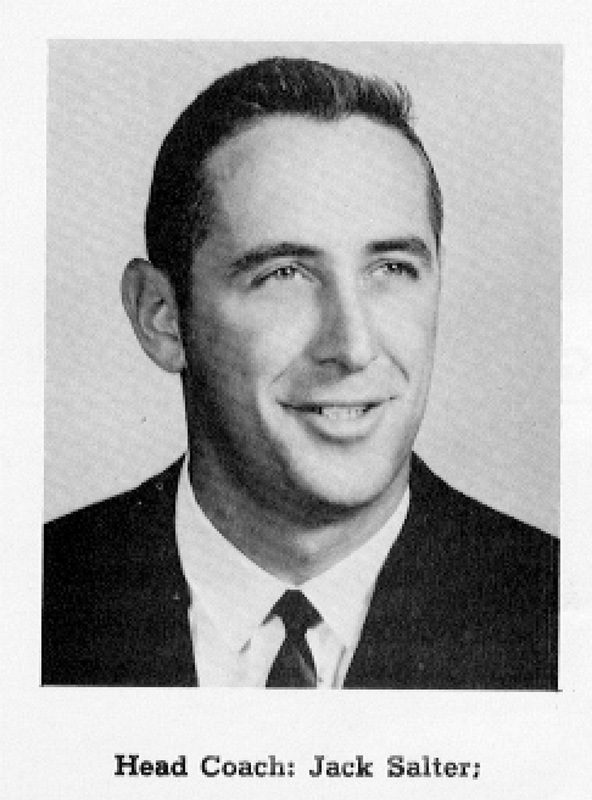 Jack was named District Coach of the Year 12 times, Metro Coach of the Year 3 times and State Coach of the Year 3 times, in 1975, 1976 and 1987. He was chosen to coach the State All Star Football Game 3 times. 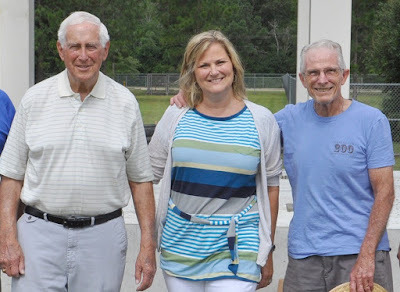 "Jack was named National Coach of the Year by the High School Football Coaches of America in 1991 and was again nominated for the same award in 1992. In 1989 he was awarded the “Casey Kozminski Award” given by the Louisiana Sports Writers Association. 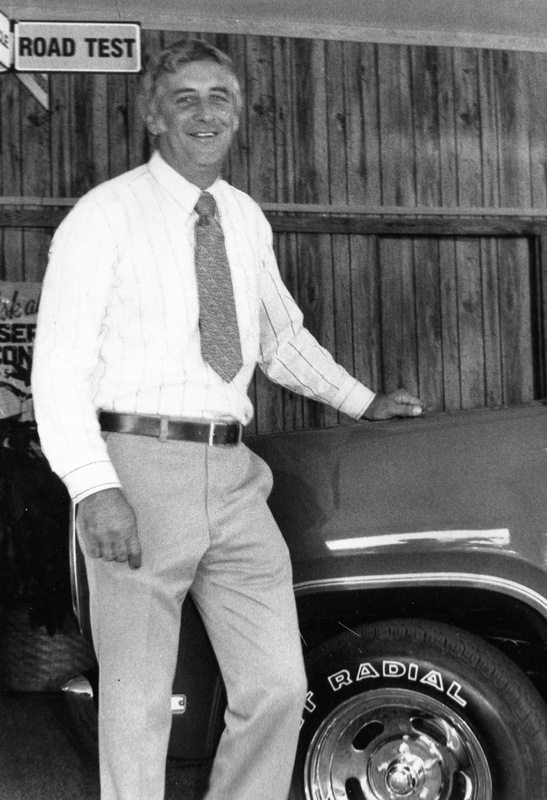 Jack was inducted into the Louisiana High School Athletic Association and Louisiana Coaches Association Hall of Fame in 1993. "In 1996 he was presented the Amateur Football award by the New Orleans Chapter of the National Football Foundation and College Hall of Fame for Outstanding Achievements on the Football Field. He was inducted into the Greater New Orleans Sports Foundation Hall of Fame in 2012. 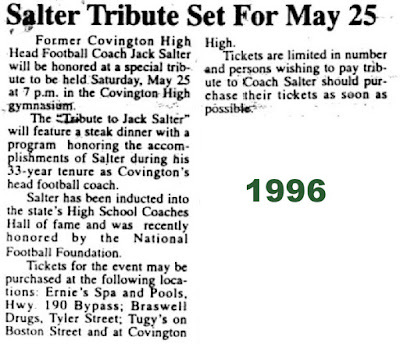 "In 2001 he was given the greatest honor of his professional life when the St. Tammany Parish School Board named the Covington High Stadium as “Jack Salter Stadium”. His last trip by the stadium was about a week before his death. Passing it gave him great comfort and the Lions great 2017 season certainly made him smile with pride. He would tell you that Once a Lion, Always a Lion and he lived in that belief until the day he died." 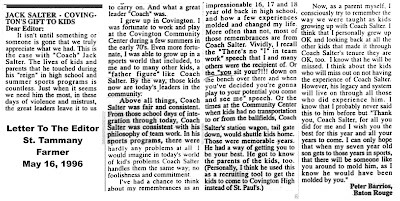 If you missed it above, here's another chance to view a 2013 segment from a Channel 13 "Chalk Talk" television program features Coach Salter's Hall of Fame Ceremony. Click on the "play triangle" video link above to view the segment.